Cleaning is not my favorite pastime, so finding easy spring cleaning hacks is the only way I know the job will get done. I also have to admit that giving your home a deep clean really does make it feel so much nicer and fresher. And there are so many reasons that cleaning is important, from health benefits to psychological wellbeing. It’s easy to get overwhelmed with just the thought of starting to spring clean your home. 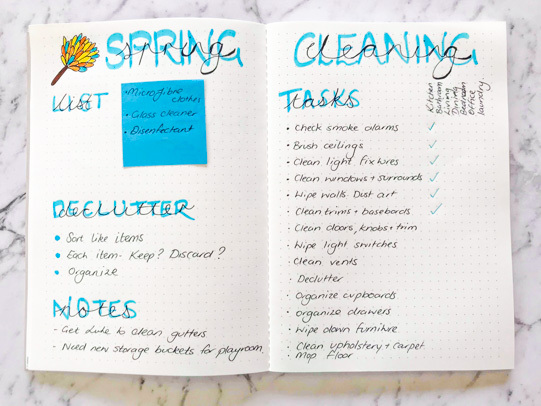 That is why using your Bullet Journal for spring cleaning is genius! 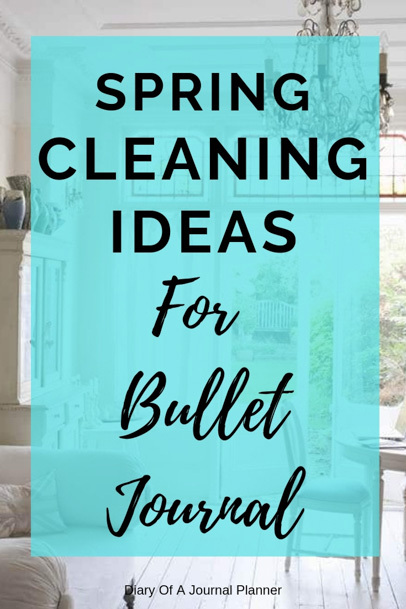 There are so many bullet journal spreads and ideas that will help make spring cleaning easier and more efficient. 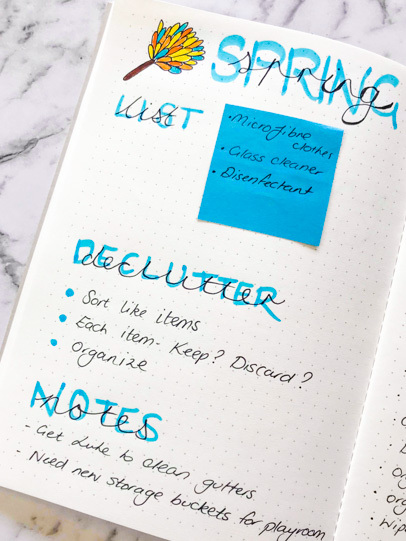 Here are some of my favourite ways to use my Bullet Journal for Spring Cleaning. Find the cleaning systems that work for you and get started for a home that sparkles and feels amazing. Before you even put one finger in a rubber glove the first step to spring cleaning is getting prepped. 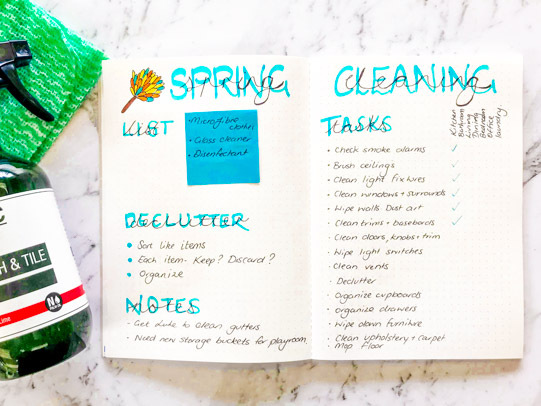 It can be so easy to procrastinate about starting the spring cleaning! Being prepped means that you really don’t have any excuses to start. Create a shopping list of all the supplies that you will need. A great idea is to mentally think about those jobs that need doing and the rooms in your home. What tools and products are best for spring cleaning? What supplies do you not already have at home? Mop, I personally love steam Mops as they sanitize as well as clean. I always use a sticky note in my bullet journal so I have a shopping list that is easy to add to and remove when I go to the store. Having a well thought out cleaning plan means that no jobs will be forgotten. It is also really satisfying to tick off completed jobs. 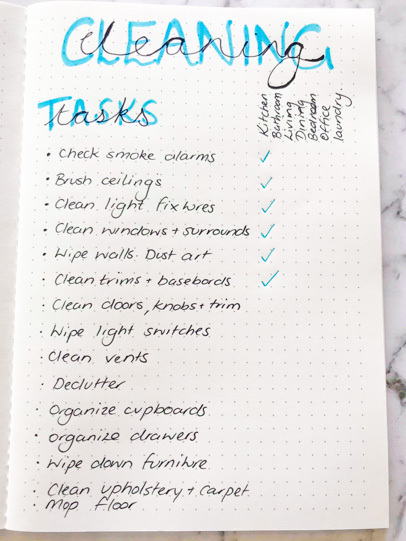 My first step is to make a spring cleaning task list so I know all the tasks that need doing. This is also a helpful way to stop overwhelm as all those big jobs are broken down into small doable cleaning tasks. 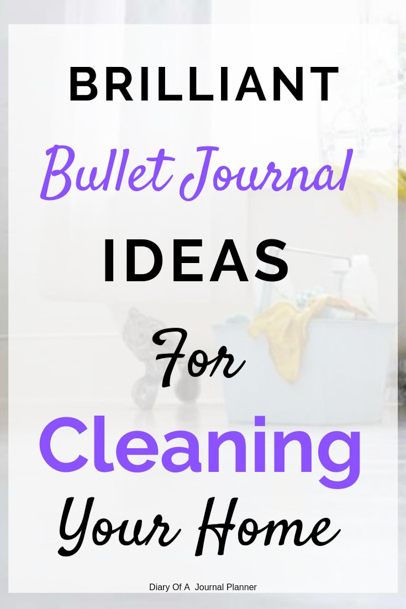 You can create one of your own or use a great spring cleaning checklist printable. So you have your spring cleaning supplies and cleaning tasks for a clean home. Let’s get cleaning, right? Not yet. There is a brilliant home hack that will make for easy spring cleaning. One of the best reasons is to declutter is that it makes cleaning easier! More space to clean and move things around as you clean. It’s easier to clean countertops, cupboards and other areas in your home if it is free of clutter. An easy way to declutter your home is to use the KonMari method. If you haven’t read her brilliant book, get your copy here and take the time to read it. It is seriously life changing! 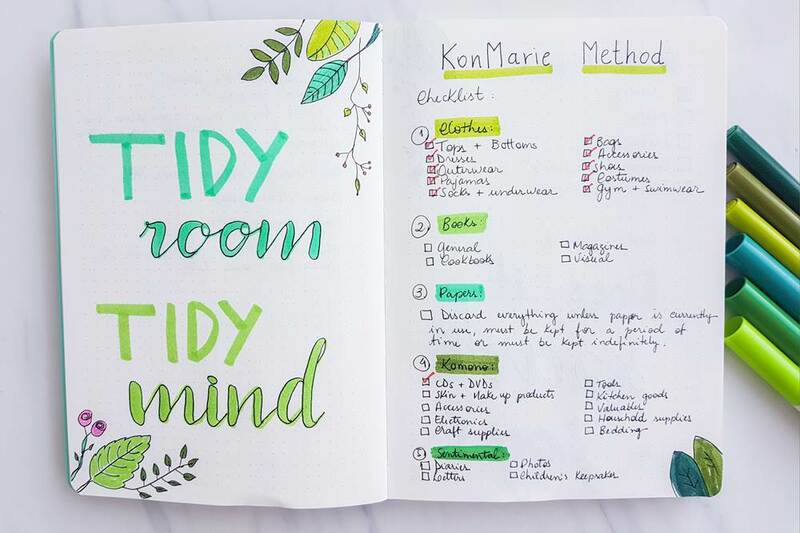 We have a post on using KonMari Method and Bullet Journal here. Be sure to head over and take a read. We even have an easy KonMari Method Checklist included that you will love. 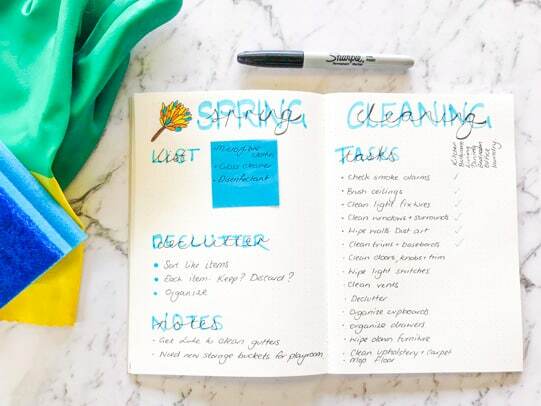 Your next step to making spring cleaning easier is to create a cleaning schedule. 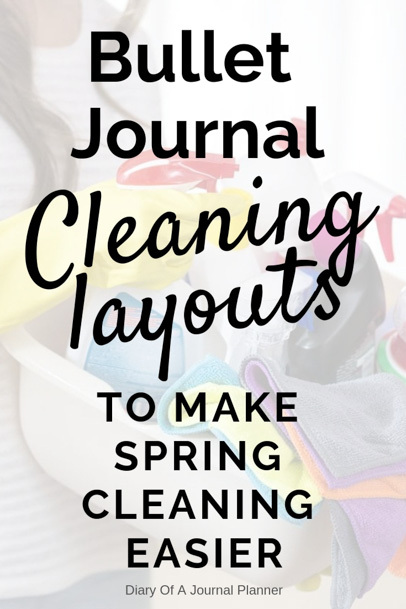 Creating a cleaning schedule is very important if you are actually going to get the Spring cleaning done. 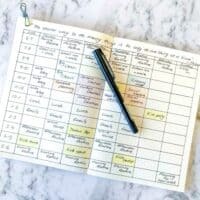 This way you can create a schedule that fits around your life and time restraints. The first thing to decide is if you are the kind of person that likes to really get stuck into the spring cleaning and do the whole house all over a few days, or if you prefer to take your time and spread the jobs around throughout a month or so. There is no right or wrong to do a cleaning spread. Just do what is best for your lifestyle. The best way for me to place cleaning in my routine is to add it when I am time blocking my week. 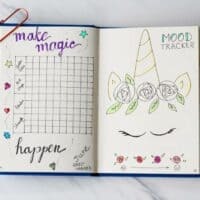 If you don’t time block yet head over to our super helpful post about how to be more productive by using a Bullet Journal. Honestly, you wont know how you worked without it once you start. I’m a slow and steady kinda gal so spread my cleaning out throughout the week. I have a little cleaning in my morning routine then do a deep clean of some part of the house every week. For example, when I clean my kitchen weekly I empty, declutter, clean and organise a cupboard. I move around the kitchen weekly till eventually the whole kitchen has been deep cleaned. With three kids at home, it is a much more realistic way for me to spring clean than trying to get a whole house done in a few days. When setting your action steps or times for cleaning just remember to be realistic. We all know it’s much harder to clean on a weekend if it’s sunny and the outdoors and sunshine is calling us. Another great option is to use a cleaning tracker. 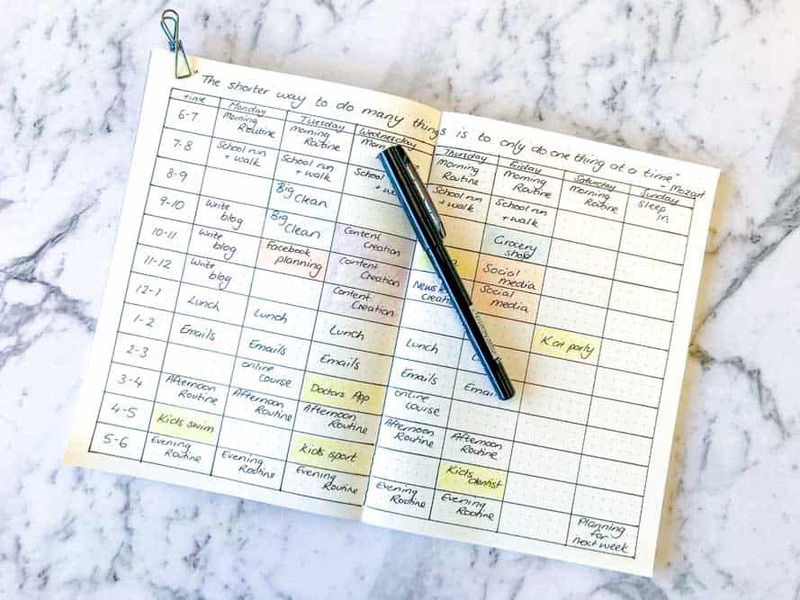 You can set this out however you like but daily, weekly and monthly lists are a great option. You can also do a yearly one for this odd occasion jobs that need doing like cleaning gutters. Split all your jobs into manageable chunks and pop them into the tracker. You will be surprised at how rewarding it is seeing all those tasks getting down. Using a cleaning tracker is also a great way to monitor you habits with cleaning and help set realistic goals. It is also an easy way to start a new habit of doing those small cleaning jobs often. This makes deep cleaning easier. 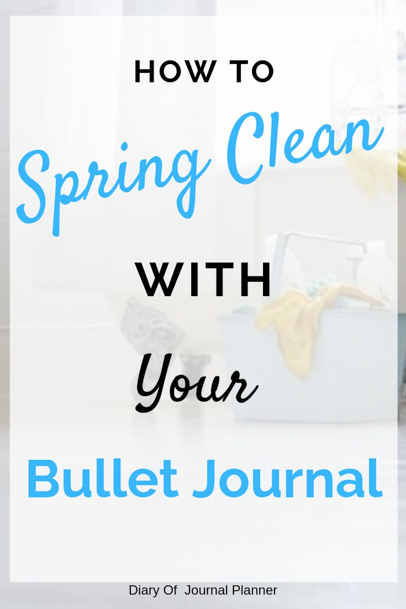 I hope you got a whole lot of new ideas on how to use your Bullet Journal to spring clean. I would love to see your cleaning spreads so be sure to post in the comments. Find the best layouts to get your life organized fast. Get more done! Find the best way to be more productive. 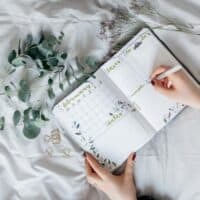 Find out how starting a Habit tracker can improve your life.